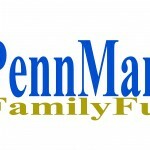 When the Penn Manor Family Fund decided it wanted a logo to identify the fledgling organization, it looked no further than Penn Manor High School. That’s where Rachel Shelley, and about 40 other students, were learning about logo design in a Commercial Art class taught by Marty Ioannidis. Ioannidis challenged her students to come up with a design, and Rachel’s bright, simple logo is now the symbol of the nonprofit group, which helps Penn Manor families in need. Rachel, who received a $50 award for her winning design, said art is her favorite subject, and the commercial art class has made her more interested in pursuing an art-related career. In the photos, Rachel goes over some of her design ideas with Deb Meckley and poses with her logo.